Name Variation William Franklin Chadwick was also known as W. F.
Name Variation William Franklin Chadwick was also known as Shadrick. Name Variation William Franklin Chadwick was also known as W. Frank. Name Variation William Franklin Chadwick was also known as Caldwell surname of step-father. Name Variation William Franklin Chadwick was also known as Frank. Name Variation William Franklin Chadwick was also known as Franklin. William Franklin Chadwick was born on 30 May 1873 at Missouri. He was the son of James Chadwick Jr. and Martha McGinnis. William Franklin Chadwick married Mahala Cornett, daughter of William H. Cornett and Sarah Elizabeth Sidebottom, circa 1894. William Franklin Chadwick married Vona Nettie Gier, daughter of (?) Gier and (?) Granely, on 6 July 1925 at Morgan, Missouri. The funeral of Mrs. Martha Cornett, almost one hundred years old, was held at Mount Union Church, near Rocky Mount, Sunday afternoon by the Rev. Raymond Gilbreath, pastor of the Eldon Methodist Church. Miss McGinnis was born in Kentucky and the records of her birth were destroyed by fire. She passed away at the home of her son, Frank Chadwick, December 8, 1933. She came with her parents to Missouri and located in Morgan County where she spent the greater part of her life until three years ago when her family moved to Moniteau County near High Point. After the death of her parents she made her home with Mr. and Mrs. Odd Kays until she was married to James Chadwick. To this union one son, Frank was born. Later after the death of her husband she was married to Mr. Caldwell. To this union two sons and a daughter were born, Thomas Caldwell of Eldon, Fanny Bell of Welldon, Colo., and William Robert Caldwell of Kansas City. After the death of Mr. Caldwell she was married Joseph Cornett who died twenty-three years ago. Mrs. Cornett was a member of the Christian Church many years. The funeral was conducted with Phillips Funeral Home service and burial was made at Mount Union Cemetery. He was buried on 5 June 1938 at near Eldon, Miller, Missouri, his mother Martha (McGinnis) Chadwick Caldwell Cornett is buried in Mount Union Cemetery, Brumley, Miller county, MO. On 12 September 1918 at WWI Registration, Camden, Missouri. 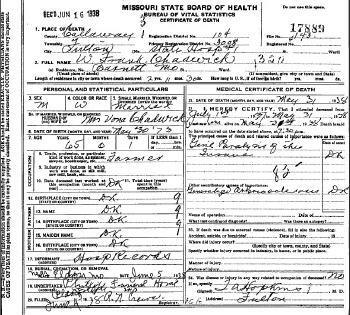 [S357] Missouri Death Certificates, 1910 – 1955 (published). [S246] U.S. Federal Census 1880 U.S. Federal Census, by Ancestry.com, Year: 1880; Census Place: Jasper, Camden, Missouri; Roll: 678; Family History Film: 1254678; Page: 11A; Enumeration District: 038; Image: 0024. [S245] U.S. Federal Census 1900 U.S. Federal Census, by Ancestry.com, Year: 1900; Census Place: Jasper, Camden, Missouri; Roll T623_845; Page: 5B; Enumeration District: 7. [S244] U.S. Federal Census 1910 U.S. Federal Census, by Ancestry.com, Year: 1910; Census Place: Jasper, Camden, Missouri; Roll T624_772; Page: 3A; Enumeration District: 32; Image: 1070. 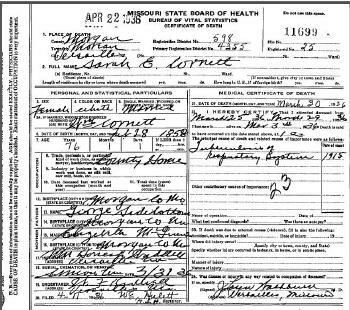 [S243] U.S. Federal Census 1920 U.S. Federal Census, by Ancestry.com, Year: 1920;Census Place: Jasper, Camden, Missouri; Roll T625_911; Page: 5B; Enumeration District: 36; Image: 110. [S250] U.S. Federal Census 1930 U.S. Federal Census, by Ancestry.com, Year: 1930; Census Place: Osage, Morgan, Missouri; Roll 1213; Page: 4B; Enumeration District: 12; Image: 1047.0. Name Variation Mahala Cornett was also known as Haley. Nickname Mahala Cornett also went by the name of Hallie. Married Name circa 1894 As of circa 1894,her married name was Chadwick. 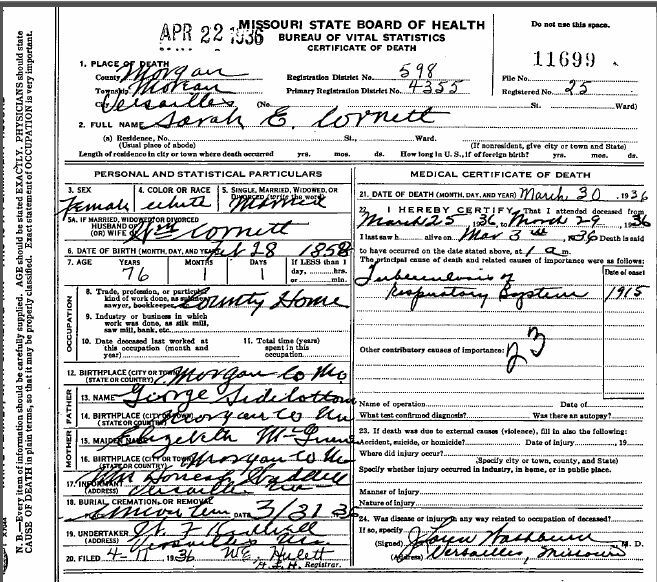 Mahala Cornett was born in March 1880 at Missouri. She was the daughter of William H. Cornett and Sarah Elizabeth Sidebottom. Mahala Cornett married William Franklin Chadwick, son of James Chadwick Jr. and Martha McGinnis, circa 1894. 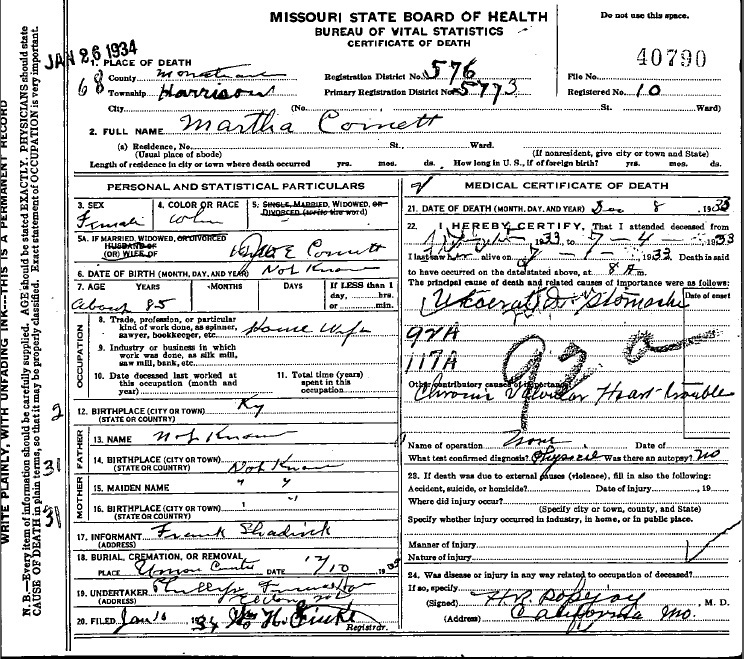 Mahala Cornett died on 12 December 1913 at during childbirth at age 33. 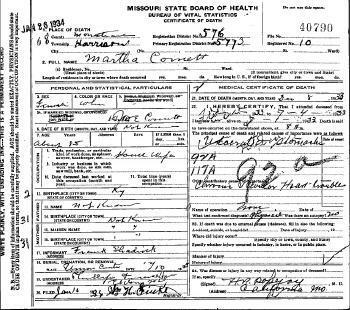 Mahala Cornett had 3 with 1 living in 1900 children. She had 6 with 2 living in 1910 children. [S246] U.S. Federal Census 1880 U.S. Federal Census, by Ancestry.com, Year: 1880; Census Place: Osage, Morgan, Missouri; Roll 705; Family History Film: 1254705; Page: 256A; Enumeration District: 196; Image: 0515. 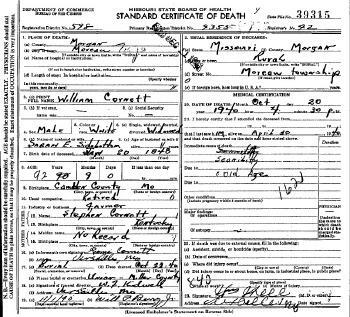 William H. Cornett was born on 20 January 1848 at Missouri also reported as Jan 1852. He was the son of Stephen Cornett and Mary (?). William H. Cornett married unknown (?) before 1875 at 1st marriage for him. William H. Cornett married Sarah Elizabeth Sidebottom, daughter of George Sidebottom and Elizabeth McGuine, circa 1880 at 2nd marriage for him; 1st for her. He was buried on 22 October 1940 at Mount Union Cemetery, Brumley, Miller, Missouri. [S245] U.S. Federal Census 1900 U.S. Federal Census, by Ancestry.com, Year: 1900; Census Place: Osage, Morgan, Missouri; Roll: 877; Page: 12B; Enumeration District: 0078; FHL microfilm: 1240877. Name Variation Sarah Elizabeth Sidebottom was also known as Lizzie. Married Name circa 1880 As of circa 1880,her married name was Cornett. Sarah Elizabeth Sidebottom was born on 28 February 1858 at Morgan, Missouri, also reported as Feb 1846 and Feb 1856. She was the daughter of George Sidebottom and Elizabeth McGuine. Sarah Elizabeth Sidebottom married William H. Cornett, son of Stephen Cornett and Mary (? ), circa 1880 at 2nd marriage for him; 1st for her. She was buried after 30 March 1936 at Mount Union Cemetery, Brumley, Miller, Missouri. Sarah Elizabeth Sidebottom had 14 with 10 living in 1900 children. She had 14 with 10 living in 1900 children. Name Variation Ann Allen was also known as Hanna A. Married Name Her married name was Sousley. Ann Allen married Walter Lee Sousley. Ann Allen was born on 12 September 1871 at Morgan, Missouri. She was the daughter of Nathan Oliver Allen and Sarah Caroline Bond. Walter Lee Sousley married Ann Allen, daughter of Nathan Oliver Allen and Sarah Caroline Bond. Walter Lee Sousley was born on 9 December 1870 at Morgan, Missouri. He died on 15 November 1944 at Kansas City, Jackson, Missouri, at age 73. Nathan Oliver Allen married Sarah Caroline Bond, daughter of Thomas Jefferson Bond and Julia Delilah (?). Nathan Oliver Allen was born on 28 March 1839 at Tennessee. He died on 28 December 1888 at age 49. Name Variation Sarah Caroline Bond was also known as Caroline. Married Name Her married name was Allen. Married Name 11 September 1889 As of 11 September 1889,her married name was Sidebottom. Sarah Caroline Bond married Nathan Oliver Allen. Sarah Caroline Bond was born in May 1845 at Missouri. She was the daughter of Thomas Jefferson Bond and Julia Delilah (?). 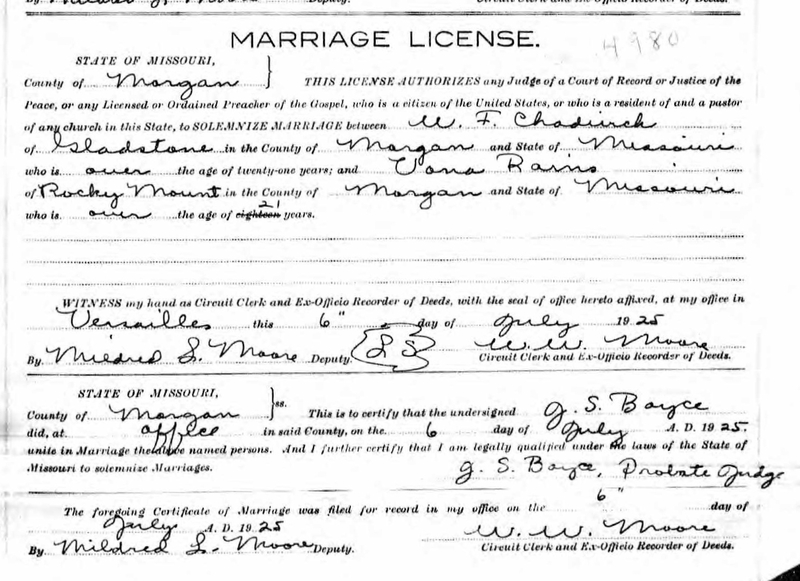 Sarah Caroline Bond married James H. Sidebottom on 11 September 1889 at 2nd marriage for her, Morgan, Missouri. Sarah Caroline Bond had 12 with 6 living in 1900 children. [S245] U.S. Federal Census 1900 U.S. Federal Census, by Ancestry.com, Year: 1900; Census Place: Osage, Morgan, Missouri; Roll: 877; Page: 1A; Enumeration District: 0078; FHL microfilm: 1240877. Married Name before 1920 As of before 1920,her married name was Rains. Married Name 6 July 1925 As of 6 July 1925,her married name was Chadwick. Married Name 16 December 1940 As of 16 December 1940,her married name was Barbarigos. Married Name 16 December 1940 As of 16 December 1940,her married name was Barbaregos. Married Name 22 July 1952 As of 22 July 1952,her married name was Goins. Vona Nettie Gier was born on 4 March 1898 at Missouri also reported as circa 1902. She was the daughter of (?) Gier and (?) Granely. Vona Nettie Gier married Henry Rains before 1920. Vona Nettie Gier married William Franklin Chadwick, son of James Chadwick Jr. and Martha McGinnis, on 6 July 1925 at Morgan, Missouri. Vona Nettie Gier married Nick Barbarigos on 16 December 1940 at Manila, Daggett, Utah, listed as Mrs. Vona Chadwick; residence for both bride and groom: Green River, Sweetwater, Wyoming. Vona Nettie Gier and Nick Barbarigos were divorced before 1949. Vona Nettie Gier married Ira Goins on 22 July 1952 at Shasta, California. Vona Nettie Gier lived in 1935 at Eldon, Miller, Missouri. She was a waitress at a cafe in 1940. 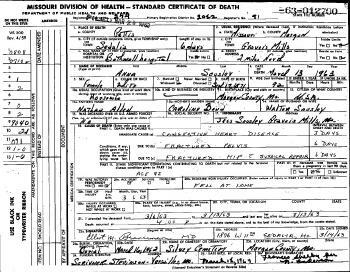 She lived in 1949 at Rt 1 Bx 126, Redding, Shasta, California, Occupation: Waiter at F W Woolworth Co.
[S204] California Death Records (published). [S373] U.S. Federal Census 1940 U.S. Federal Census, by Ancestry.com, Year: 1940; Census Place: Green River, Sweetwater, Wyoming; Roll: T627_4576; Page: 13A; Enumeration District: 19-15A. Name Variation Mildred Mearl Chadwick was also known as Mearl M.
Name Variation Mildred Mearl Chadwick was also known as Mildred S.
Name Variation Mildred Mearl Chadwick was also known as Rains surname of biological father. Married Name before 1940 As of before 1940,her married name was Starkey. Married Name 7 July 1951 As of 7 July 1951,her married name was Berry. Mildred Mearl Chadwick was born on 28 October 1920 at Eldon, Miller, Missouri. She was the daughter of William Franklin Chadwick and Vona Nettie Gier. Mildred Mearl Chadwick married Milfred Robert Starkey, son of Frederick Kile Starkey and Edith Mildred Robins, before 1940. Mildred Mearl Chadwick married William L. Berry on 7 July 1951 at Tehama, California. Mildred Mearl Chadwick died on 13 January 1999 at age 78. She was buried after 13 January 1999 at Lawncrest Memorial Park, Redding, Shasta, California. Mildred Mearl Chadwick graduated in April 1935 at Hale School, Moniteau, Missouri. [S373] U.S. Federal Census 1940 U.S. Federal Census, by Ancestry.com, Year: 1940; Census Place: Green River, Sweetwater, Wyoming; Roll: T627_4576; Page: 17B; Enumeration District: 19-15A. Name Variation Martha McGinnis was also known as Johnson. Name Variation Martha McGinnis was also known as McGinis. Married Name 24 June 1872 As of 24 June 1872,her married name was Shadwick. Married Name 24 June 1872 As of 24 June 1872,her married name was Shadrick. Married Name 24 June 1872 As of 24 June 1872,her married name was Chadwick. Married Name circa 1874 As of circa 1874,her married name was Caldwell. Married Name circa 1894 As of circa 1894,her married name was Cornett. Martha McGinnis was born circa 1847 at Kentucky also reported as Texas and Missouri; also reported as circa 1843 or 1853. She was the daughter of (?) McGinnis and unknown (?). Martha McGinnis married William Caldwell circa 1874. Martha McGinnis and William Caldwell were divorced before 1894. Martha McGinnis married Joseph Cornett circa 1894. She was buried on 10 December 1933 at Mount Union Cemetery, Brumley, Miller, Missouri. Martha McGinnis had 4 with 4 living in 1900 children. She had 4 with 4 living in 1910 children. 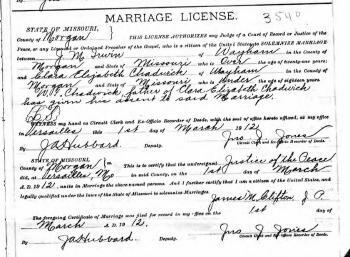 Child of Martha McGinnis and James Chadwick Jr.
[S371] Missouri, Morgan County Missouri Marriages, Book 2 - Alphabetical by Groom. 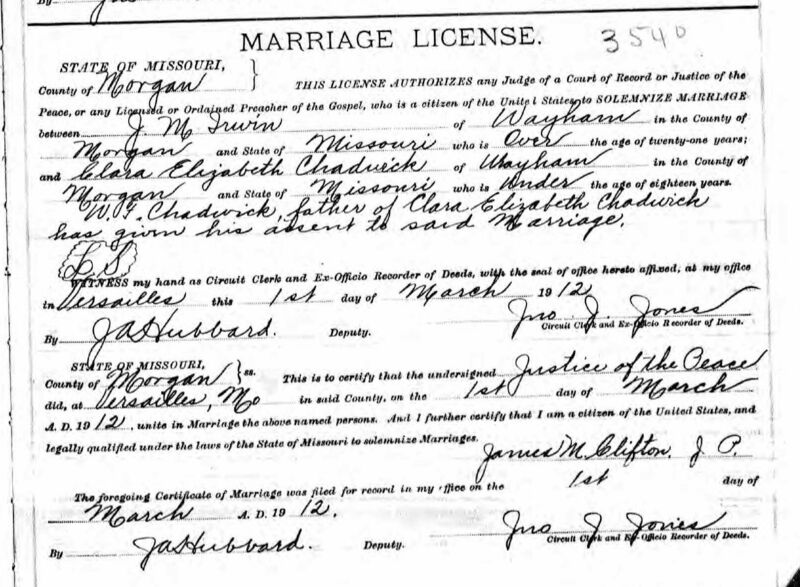 [S387] Family Search; Multiple Records, "Missouri Marriages, 1750-1920," database, FamilySearch (https://familysearch.org/ark:/61903/1:1:V28T-M68 : 6 December 2014), James Shadwick and Martha Maginis, 24 Jun 1872; citing Morgan,Missouri; FHL microfilm 981,048. [S248] U.S. Federal Census 1860 U.S. Federal Census, by Ancestry.com, Year: 1860; Census Place: Osage, Camden, Missouri; Roll: M653_611; Pages: 15-16; Image: 19; Family History Library Film: 803611. [S247] U.S. Federal Census 1870 U.S. Federal Census, by Ancestry.com, Year: 1870; Census Place: Jasper, Camden, Missouri; Roll: M593_764; Page: 510A; Image: 577; Family History Library Film: 552263. Name Variation Clara Elizabeth Chadwick was also known as Elizabeth. Married Name 1 March 1912 As of 1 March 1912,her married name was Irwin. Clara Elizabeth Chadwick was born in September 1895 at Missouri. She was the daughter of William Franklin Chadwick and Mahala Cornett. 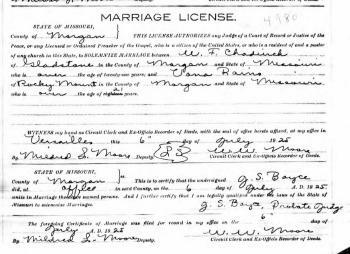 Clara Elizabeth Chadwick married Martin Jerome Irwin, son of Vincent Allen Irwin and Elizabeth Sarah Polly, on 1 March 1912 at Versailles, Morgan, Missouri, "W. F. Chadwick, father of Clara Elizabeth Chadwick, has given his assent to said marriage." Clara Elizabeth Chadwick died between 1913 and 1918. Clara Elizabeth Chadwick and Martin Jerome Irwin lived between 1912 and 1914 at California, Voter Registration, Dinuba, Tulare, California, he is listed as a rancher; she is a housewife. Both are listed as Republican. Name Variation Clara Elizabeth Chadwick was also known as Myrtle. Married Name before 1953 As of before 1953,her married name was Harbison. Clara Elizabeth Chadwick was born on 13 August 1903 at Missouri also reported as Arkansas. Clara Elizabeth Chadwick married (?) Harbison before 1953. She was buried after 20 March 1953 at Ceres Memorial Park, Ceres, Stanislaus, California. Clara Elizabeth Chadwick obtained US Social Security Card. William Caldwell was born in 1845 at Missouri also reported as Ohio; also reported as circa 1851. He married Martha McGinnis, daughter of (?) McGinnis and unknown (? ), circa 1874. William Caldwell and Martha McGinnis were divorced before 1894. William Caldwell died before 1920. [S245] U.S. Federal Census 1900 U.S. Federal Census, by Ancestry.com, Year: 1900; Census Place: Osage, Camden, Missouri; Roll: 845; Page: 12A; Enumeration District: 0009; FHL microfilm: 1240845. 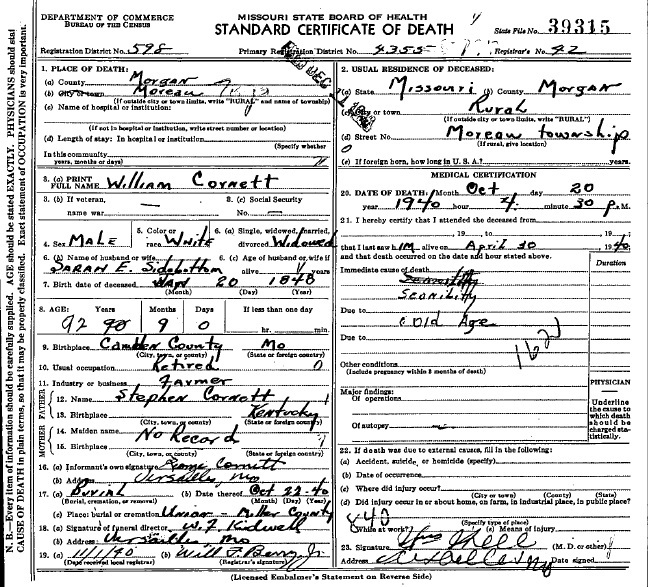 Edward Cornett was born circa 1875 at Missouri. He was the son of William H. Cornett and unknown (?). Edward Cornett died before 1955. Name Variation William Robert Caldwell was also known as Robert. 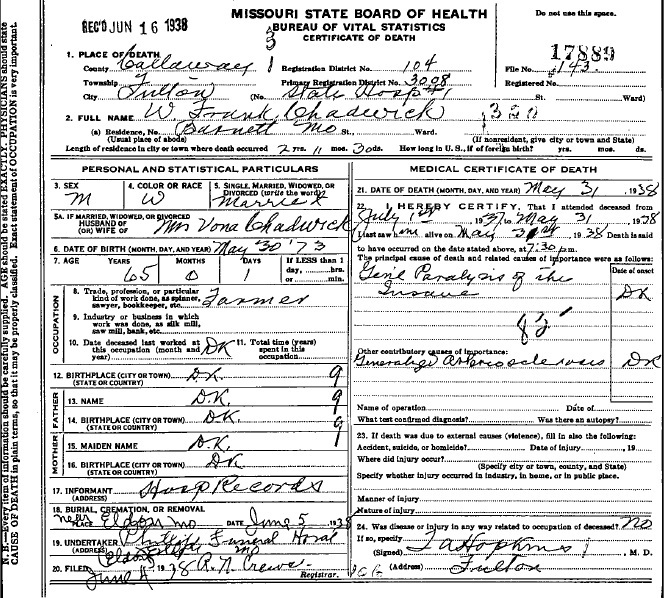 William Robert Caldwell was born on 25 March 1887 at Missouri also reported as 05 May 1885. He was the son of William Caldwell and Martha McGinnis. 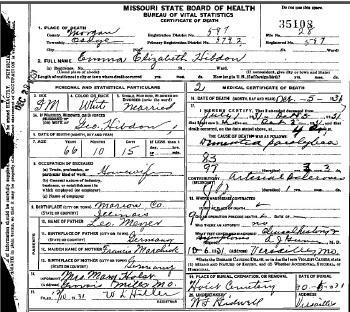 William Robert Caldwell married Anna Mary Copeland on 15 December 1908 at Butler, Bates, Missouri. William Robert Caldwell died on 23 June 1933 at Riverside, California, at age 46. On 12 September 1918 at World War I Draft Registration, Missouri, stamp "Missouri State Penitentary, Jefferson City, MO." Nearest relative is mother Martha Cornett. Name Variation Anna Mary Copeland was also known as Annie. Married Name 15 December 1908 As of 15 December 1908,her married name was Caldwell. Anna Mary Copeland was born on 23 February 1889 at Missouri. She married William Robert Caldwell, son of William Caldwell and Martha McGinnis, on 15 December 1908 at Butler, Bates, Missouri. Anna Mary Copeland died on 22 May 1966 at Riverside, California, at age 77. Name Variation Walter Hardy Caldwell was also known as Durand. Walter Hardy Caldwell was born on 30 May 1909 at Missouri. He was the son of William Robert Caldwell and Anna Mary Copeland. Walter Hardy Caldwell died on 20 July 1977 at Riverside, California, at age 68. Name Variation Joseph Cornett was also known as Joe. Joseph Cornett married Martha McGinnis, daughter of (?) McGinnis and unknown (? ), circa 1894. Joseph Cornett died before 1900. Name Variation Thomas M. Caldwell was also known as John Thomas. Thomas M. Caldwell was born on 11 April 1874 at Missouri also reported as Apr 1875. Thomas M. Caldwell married Sarah Elizabeth Hoskins, daughter of Peter Hoskins and Nancy A. (? ), on 11 January 1902. Thomas M. Caldwell died on 14 January 1938 at age 63. George Hibdon married Emma Elizabeth Meyer, daughter of Leo. Meyer and Francis Marchick. George Hibdon was born on 26 July 1863 at Morgan, Missouri. He was the son of Thomas Martin Hibdon and Martha Perneica Phillips. George Hibdon died on 1 November 1936 at age 73. [S246] U.S. Federal Census 1880 U.S. Federal Census, by Ancestry.com, Year: 1880; Census Place: Osage, Morgan, Missouri; Roll: 705; Family History Film: 1254705; Page: 261C; Enumeration District: 196; Image: 0525. Name Variation Emma Elizabeth Meyer was also known as Emmie. Married Name Her married name was Hibdon. Emma Elizabeth Meyer married George Hibdon, son of Thomas Martin Hibdon and Martha Perneica Phillips. Emma Elizabeth Meyer was born on 20 November 1864 at Marion, Illinois. She was the daughter of Leo. Meyer and Francis Marchick. Sa. Briggs married Louisa B. (?). Married Name Her married name was Briggs. Louisa B. (?) married Sa. Briggs. Charles M. Bowler was born at Kentucky. He married Liza Anna Hollaway. Married Name Her married name was Bowler. Liza Anna Hollaway married Charles M. Bowler. Liza Anna Hollaway was born at Virginia. Millard Hastings was born on 14 May 1884 at Sauk, Wisconsin, also reported as 14 May 1885. He married Mattie M. Garske, daughter of William Garske and Mary M. L. Rambow, on 24 April 1910 at Beadle, South Dakota. Millard Hastings died in 1918. Millard Hastings was a painter and paper hanger in 1910. [S244] U.S. Federal Census 1910 U.S. Federal Census, by Ancestry.com, Year: 1910; Census Place: Huron Ward 3, Beadle, South Dakota; Roll T624_1476; Page: 21A; Enumeration District: 18; Image: 481. Name Variation Dorothy Ann Hastings was also known as Opal M. changed her name from Opal to Dorothy on her birth certificate back in the 1960s. Dorothy Ann Hastings was born on 4 February 1913 at Sauk, Wisconsin. She was the daughter of Millard Hastings and Mattie M. Garske. Dorothy Ann Hastings died on 31 December 1999 at Orange, California, at age 86. [S243] U.S. Federal Census 1920 U.S. Federal Census, by Ancestry.com, Year: 1920;Census Place: Madison Ward 6, Dane, Wisconsin; Roll T625_1981; Page: 5B; Enumeration District: 49; Image: 654. [S250] U.S. Federal Census 1930 U.S. Federal Census, by Ancestry.com, Year: 1930; Census Place: Madison, Dane, Wisconsin; Roll 2567; Page: 6B; Enumeration District: 46; Image: 561.0. James William Hastings was born on 6 February 1915 at Wisconsin. He was the son of Millard Hastings and Mattie M. Garske. James William Hastings died on 23 December 1999 at Minnesota at age 84. Harvey A. Hastings was born on 25 March 1917 at Wisconsin. Harvey A. Hastings died on 1 July 1984 at Dane, Wisconsin, at age 67.